So you just got yourself a bottle of one of our premiere wines that you would like to save for a special occasion. We don’t blame you, they are incredible vintages and a great way to enhance a celebration. But the question remains, how to properly store your wine so it doesn’t spoil and you can enjoy it when you are ready. Wine needs the right environment or it will spoil, so let’s look at how you can best store your wine until you are ready to drink it. One of the most important aspects of storing wine is the temperature in which it is stored. You need a place that doesn’t fluctuate much when it comes to temperature and the right amount of humidity. You want to store your wine between 45 – 65 F, not too hot and not too cold. Wine coolers are great in the short term, so if you buy wine in October you want to drink at Christmas then perfect. Long term there isn’t enough humidity and your cork will dry out and ruin your wine. Sunlight is not your friend, this is why for thousands of years wine was stored in cellars, to keep it out of the sun. You want to keep your wine in a cool dark place away from sunlight. House lights won’t ruin your wine but they can fade the label, altering the value of a very expensive bottle of wine. 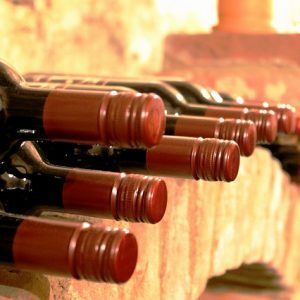 Wine lovers tend to store bottles of wine with the bottle lying on its side. The idea is to keep the cork wet so that it doesn’t dry out. You only really need to do this if you are storing wine for years. Short term storage this really isn’t that important. You can get some really great wines today that don’t use a cork but rather a screw top or plastic cork and those you don’t have to worry about at all. There are some subtle differences to storing red and white wines, but for the most part these storage methods will work for either. No matter what color wine you prefer proper storage is important. Find the right spot in your home where you can store your wine that is cool and dry. Wine is meant to be enjoyed not tucked away for safe keeping never to be seen again.